Allow us to bring the bar to you and your guests. Indulge in a glass of tipple created specially for each of your guests. Interact with the bartenders and let them know your flavor profiles and palate, watch them craft a drink out of the many ingredients they've brought over. Sit back, relax and enjoy the cocktails while we provide you with service par excellence. This package seeks to bring interaction to a whole new level. Laid out on a table beside the bar are fruits, citruses and herbs. 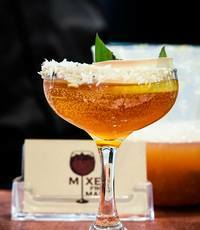 Guests are invited to pick the ingredients and spirit they want in their cocktail. All that's left is to let the bartender know their taste preferences and the cocktail will be prepared. A different dimension to bartending. Wow your guests with an infusion of Nitrogen with our drinks, turning it into an edible cocktail. Let our bartenders introduce a new element to drinking, by coating an ingredient of a cocktail into caviars which when bit into releases flavors which interacts with the drink.